Name: what the users will see as a heading. 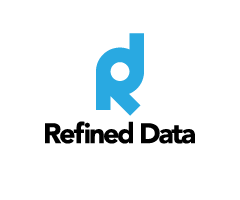 URL: where the link will take the user. Sort Order: the positioning the item will take in the header sequence. This can be defined to the decimal point (Example: if Home is sort order 1 and Courses is sort order 2, if I want to insert the heading My Courses in between these two items I could give it a sort order 1.5). 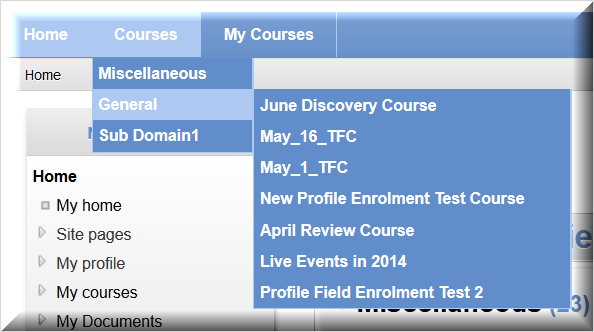 [[mycourses]] will list the courses a user is enrolled in. To add a heading below Home, click on the plus sign to the right of Home. To close the editor, click on Home. To create menus in various languages, the admin must switch their language to the other language and then build the menus using the editor for each language on their site. 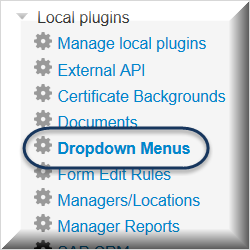 The colors of the drop-down menu as well as all Refined Theme colors can be selected at Administration>>> Site administration>>> Appearance>>> Themes>>> Refined.